Social Media has grown to become a major channel for B2B marketers. The team at RealBusinessRescue put together a very telling infographic that highlights the trends of B2B social media usage in 2013 while offering advice for B2B use in 2014. The entire infographic is below. I’d love to know your thoughts on the infographic. Do any of these stats and figures presented surprise you? Spring is in the air and that means MLB Opening Day is right around the corner! In honor of the big day (which will feature my Boston Red Sox receiving their 2013 World Series Championship Rings – just sayin’), the team at Facebook has put together a map that highlights team allegiances – measured in terms of likes – across the United States. You will immediately notice that the Yankees, Brave and Rangers (which is a bit of a surprise) take up a majority or the map. Red Sox Nation is also up there as well! 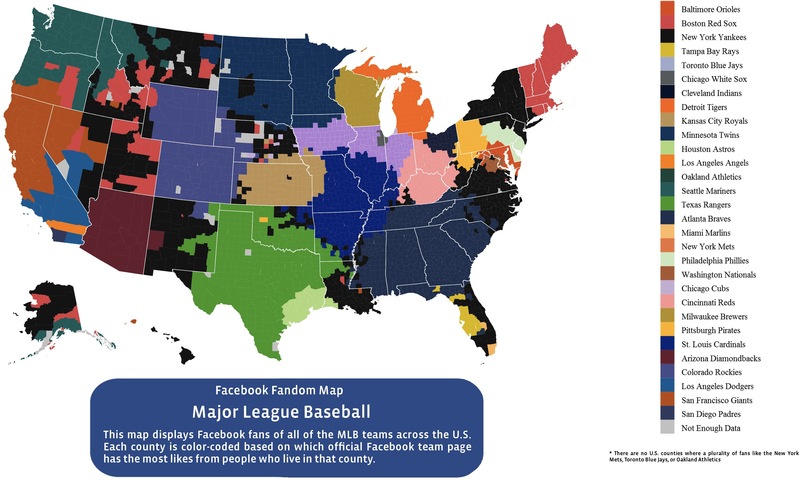 However, Facebook notes that there is not a single county in the US that aligns with the A’s, Mets or Blue Jays (sorry to all my friends up in Toronto). In our latest marketing white paper, Social Success Stories: Marketing Lessons from Industry Leaders, we analyzed the top social brands in retail, services and sports to identify and share their best-in-class strategies for success. We reviewed their social presence and analyzed the content strategies used by social marketing leaders such as Converse, Whole Foods, NBA, ESPN, Farmers Insurance, and American Express, on the two most popular social networks, Facebook and Twitter. We left no strategy unturned – and we shared the answers to the following questions: What do these successful brands post? How often? What kind of imagery supports their brand? What content makes their audience tune in and take action? With which brand to you most closely identify? Will you apply some of these learnings to your own campaigns? Let us know on Twitter at @awarenessinc. One of the main complaints I hear when talking to companies about social marketing is lack of control. They don’t feel that their content distribution is systematic, they don’t understand their audience and influencers, and they don’t feel they are agile enough to deal with functional changes. Luckily, Ric Dragon presents a process approach to social media marketing in his new book Social Marketology: Improve Your Social Media Processes and Get Customers to Stay Forever. Ric is the CEO of DragonSearch, a regular speaker for Google at their Get Your Business Online seminars, a regular columnist for Marketing Land and Social Media Monthly. In anticipation of our Social Marketology webinar next week, we sat down with Ric for some Q and A. What can readers expect to learn from reading Social Marketology? There are two major aspects of the book: The first and most fundamental is that Social Marketology provides a framework for social media marketing. We can all get caught up in the constant and rapid changes taking place in the tools and platforms. By having these main building blocks in place, you’ll be able to adjust to whatever changes come along. Secondly, the book provides a glimpse into the myriad areas of knowledge that come into play with social media. The discipline is touched on by ethnography, psychology, neuro-science, game theory, business history, and more. The book touches on these things enough to guide the reader to deeper reading if they choose. In Social Marketology you write “In some types of organizations, and at a certain scale, it makes sense for an entire organization to be social.” By that you mean social being used for product development, customer service, and sales messaging. What organizational types and scale were you referring to? I once asked Ford’s head of social media, Scott Monty, how much of Ford was social-enabled, and he proudly stated something to the effect of about 24 percent. He added that it just wasn’t practical for line workers. So, in manufacturing, it isn’t difficult to imagine the hurdles you’d have to jump to have people who operate machinery, for instance, to be tweeting. In knowledge work where people are already working on a computer throughout the day, it might not be so difficult. Large organizations, of course, have their own challenges – but there is often bandwidth in each employee’s day for social communications. In smaller companies, resources are often stretched so thin that for everyone to engage in social may not be practical. Claiming real estate on social platforms is one of the basic activities you cite for social marketing. How do you know which to claim and should you claim them before you are ready to fully utilize them? There really isn’t much risk in creating a social profile, and then not using it. There is an enormous risk, however, if a platform takes off in popularity, and you don’t own your own brand name. For that reason, I advocate for the creation of profiles on as many social platforms as possible. At the very least, you usually have the opportunity to brand the profile, and to create a link back to your own site, which is minimally helpful for search engine optimization. One of the main premises of the book is that social media behaviors follow patterns. What dictates these patterns? Do these patterns change? The patterns in social media platforms have emerged through the rapid growth of the web. It’s possible that elements of these patterns are hard-wired into our brains, or reflect how we already operate in the physical world. On the other hand, we see new patterns, like those demonstrated in Pinterest, arise quickly. People are even making websites that mimic the image board interface of Pinterest! So, I have no doubt that new patterns will emerge, and through a type of Darwinistic winnowing, many will pass by while others will dominate. You are the cofounder of the firm DragonSearch, which manages SEO, SEM, and social marketing for clients. What do you see for the future of the relationship between search and social? In social, we’re dealing with the context of how this information is shared. These two things, relevance and context become our domain in which we work. Social boosts search with links, and search helps us understand how our communities think. This is exciting to think about: in digital marketing, our job is to help organizations have a deeper context and greater relevance with their markets. Marketing is often relegated to being a component of sales – but if we assume the digital marketing approach; we become a part of a larger business purpose. For more insights from Ric Dragon, be sure to attend our upcoming joint webinar: Social Marketology: Process in Social Media Marketing. You can also download chapter 1 of Social Marketology: Improve Your Social Media Processes and Get Customers to Stay Forever. Wondering if LinkedIn or Pinterest are right for your brand? You are not alone – marketers have been focusing their efforts on the Big 3 (Twitter, Facebook, and YouTube) but increasingly are looking to LinkedIn and Pinterest to build a presence and connect with their constituents. As a follow-on to our latest white paper, Five Killer Strategies to Dominate Social Media’s Big 3: Facebook, Twitter, and YouTube, which offers insights into how the leading social platforms can be used for marketing success, we turn to dissecting the best social marketing practices on Pinterest and LinkedIn, among the most popular social platforms of our days. LinkedIn boasts 147 million users and Pinterest recently hit 10 million unique active users. These two social networks hold untapped potential for reaching new customers waiting for your brand to make connections with them. Here are some ideas on how marketers can approach the social platforms along with some suggestions for tools they can use to get the most of their efforts. We also bring two great examples of brands doing it right on Pinterest and LinkedIn. Although Pinterest is still in its earlier stages, it’s clearly here to stay. Tools are popping up left and right to help marketers increase the effectiveness of their Pinterest efforts. Tools such as PinReach and PinPuff make identifying influencers easier and more efficient. Content development tools for Pinterest, such as Pinstamatic, Snapito, and Pinerly, allow brands to be creative and visually stimulating with their pins. Chobani, a yogurt brand, uses Pinterest as a way to tap into their customers’ lifestyles and create a sense of brand loyalty. The themed boards are based on their target audience’s interests, such as recipes using yogurt, nutrition, and being active. Chobani uses creative titles, such as “Chobani Fit” and “Chobaniac Creations”, a clever strategy that have helped the brand gain over 6,000 followers on Pinterest. Chobani used Pinterest to tap into their customers’ lifestyles. LinkedIn has gained a reputation for successful lead generation, with marketers ranking the platform as 277% more effective than other platforms in a marketing study conducted by HubSpot. The “Products and Services” tab that displays customer-generated recommendations make LinkedIn an extremely effective lead generation tool. Embedding the “Recommend on LinkedIn” widget on your homepage is one way to encourage customers to actively promote your brand. Juniper Networks, a business-to-business company that offers high speed, reliable switching routers to satisfy ISP-level performance, has a great LinkedIn company page. With over 40 products and services listed, Juniper Networks has 215 customer recommendations on their “Products and Services” page. The “Overview” tab is effectively utilized with widgets that give the most important and updated information about the company. Juniper Networks uses LinkedIn for promoting products and services and customer recommendations. With the right strategies, LinkedIn and Pinterest can be powerful platforms to add to your social media toolbox. If you are looking to the make the most of your Pinterest and LinkedIn efforts, download our complimentary whitepaper, Beyond the Big 3: 5 Killer Strategies to Dominate LinkedIn and Pinterest. To learn more about how to boost your brand’s success on Pinterest and LinkedIn, download our recent white paper, Five Killer Strategies to Dominate Social Media’s Big 3: Facebook, Twitter, and YouTube. In our latest white paper, Actionable Social Analytics: From Social Media Metrics to Business Insights we unveiled the Social Analytics Framework for Marketing and Sales Effectiveness. Use this framework to determine KPI’s according to marketing objective.